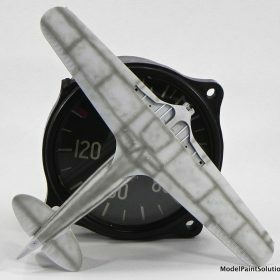 This 3rd volume of the MPS “Airbrushing Tips ‘n Tricks” series has been in progress a long time. 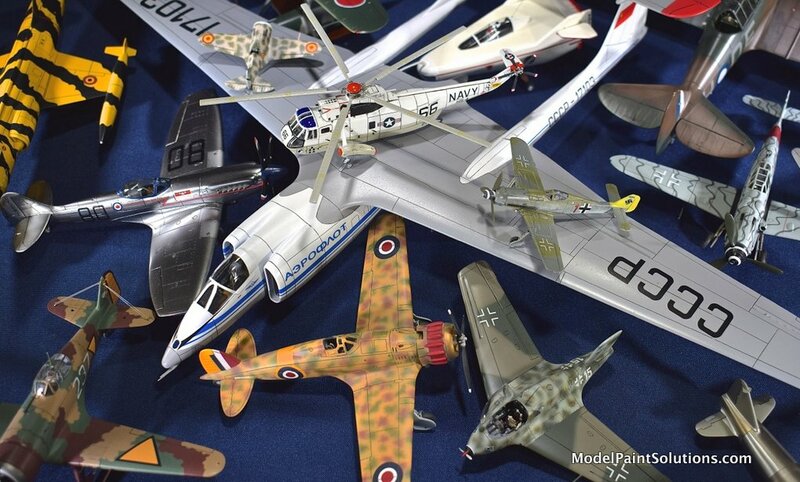 So long that I started it prior to attending the national convention of the International Plastic Modelers Society (IPMS) held the first week of August in Phoenix Arizona where a great time was had by all. I want to send a sincere thanks to the members of the Craig Hewitt Chapter of IPMS Arizona for organizing and hosting an awesome show. Many Thanks! 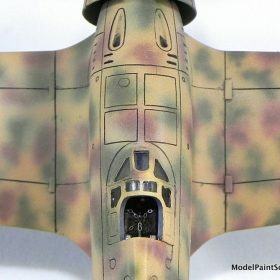 While in Phoenix I demonstrated Fine-Line airbrushing techniques and chatted with many modelers and airbrush aficionados. During these conversations many guys described the problems they have diluting and spraying acrylic paints. Many (most?) 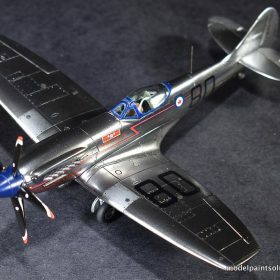 of these problems are identical to the airbrushing issues I receive in detailed emails from from disgruntled modelers all over the world on a regular basis. The most common problem, Clogging, followed closely by Unreliable Performance and Difficulty Spraying a Fine Line are all issues related to spraying paint that is too thick combined with not cleaning the brush sufficiently. 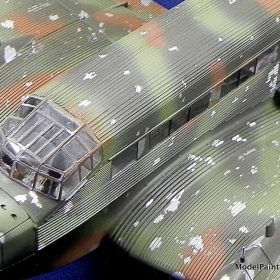 (For suggestions on keeping your airbrush clean see Tips ‘n Tricks v2: Getting the Gunk Out.) In addition to preparing more dilute paint mixtures, including a wetting agent or paint retarder such as Liquitex in the mix will help as well, especially for those spraying in warm, arid climates (more below). 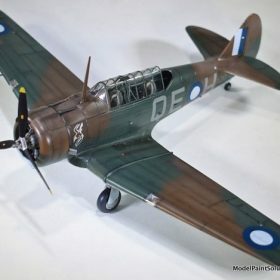 The third and fourth most common problems, Difficulty Spraying Fine Lines and Rough Finishes, are most often related to using too thick a paint mixture and not using an appropriately sized airbrush tip for the job. “Tip” refers to the nozzle aperture (in millimeters) where small tips are around 0.20mm and larger tips start at around 0.40mm. Matching the airbrush tip size to the specific spray job is easily addressed as many airbrush manufacturers produce different sized tips for their brushes including Harder-Steenbeck, Iwata, Badger, Grex, and Aztec. This article references airbrush tips made by Harder-Steenbeck and fitted to H&S Infinity or Evolution dual-action airbrushes. After trying other brushes I settled on the Infinity and have driven one for 10+ years due to the selection of different sized tips available and the degree of control it provides for Super Fine-Line airbrushing. For more information on configuring the Harder-Steenbeck Infinity for Fine-Line work go here. 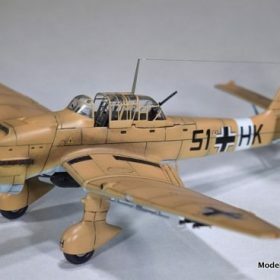 Because I’m all about enjoying the act of airbrushing I find that matching the airbrush tip size and the paint dilution to the spray job are the surest ways of addressing the Top Four Airbrushing Problems. 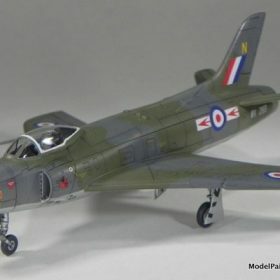 I build mostly 1/72, 1/48, and 1/32 aircraft, dabble in 1/72 and 1/35 armor, and occasionally build a 1/144th kit just to cleanse the modeling palette. For painting this range of scales I use multiple tips ranging in size from a very small (0.15mm) to a relatively large (0.40mm). Please bear in mind that what follows are only suggestions based on my skill set and experience. 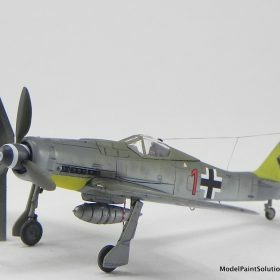 There are as many good techniques for spraying fine lines and clear coats with acrylic paints as there are modelers loading up their airbrush paint cups. 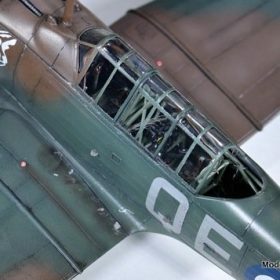 An easy way to achieve smoother finishes is to match both the the paint dilution and airbrush tip to each type of spray job. 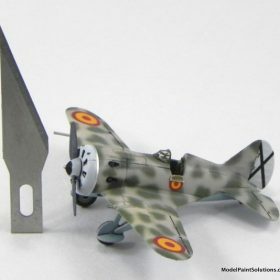 Many modelers just starting out, naturally try to make one tip size work for all jobs. I did this myself for many years and was quite happy in the process thank you very much. That said, with experience comes a finer eye for finishes and, for me, the realization that matching the tip size to the job produces a finer finish and, most importantly, makes the spray job easier and more enjoyable which is really what its all about 🙂 Before we get to matching airbrush tip size to the job, let’s consider a mismatching of the two. 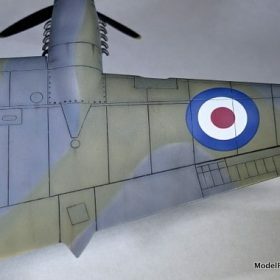 Attempting to apply a clear coat using a small tip (generally less than 0.20mm) or trying to spray a fine line (1 mm-wide or less) with a 0.40mm tip (or larger) are both good examples of bad matches between tip size and spray job. 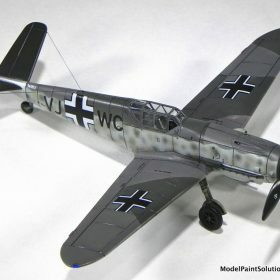 There are modelers out there with the airbrushing skills and experience to pull off both of these airbrush challenges. Neither is easy but I’ve seen it done. 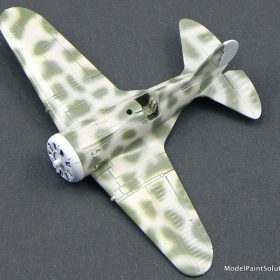 That said, the average modeler would find them a challenge and the results would most likely be less than ideal. 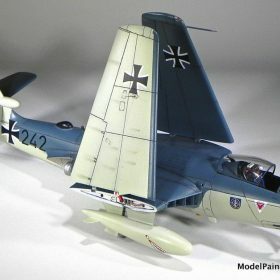 However, there are always exceptions in airbrushing as there are in life as demonstrated by the clear coats applied with a 0.20mm tip to all three of these 1/144th scale models: Zvezda I-16, Platz Fw-190D, and AFV Sea King (below). Here, the tip size was matched to the amount of coverage required for the job at hand. 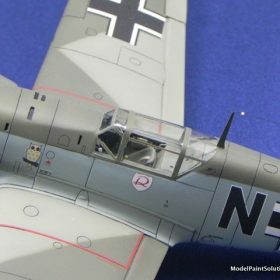 Building in the broad range of scales I do (1/144 to 1/32), tips ranging in size from 0.15 to 0.4mm are very handy to have for specific jobs. For comparison, most airbrushes intended for modeling come fitted with one tip ranging in size from 0.20 to 0.50mm. That’s a wide range. I find that a tip size ~0.30mm is great for General work but not suited for either Fine-Line work or spraying a Clear Coat. For those jobs I prefer tips of 0.15 and 0.40mm, respectively (more below). 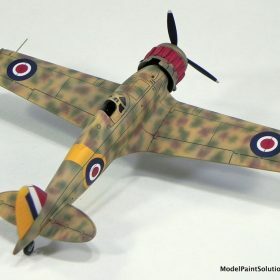 To be clear, there are many experienced modelers that can shoot perfect fine lines with a 0.30mm tip. That said the smaller the tip, the more capable the tip is of spraying a thin line. In my hands fine and super fine-lines (less than 1mm) are both easier and more reproducible when shot with tips of 0.20mm or smaller. 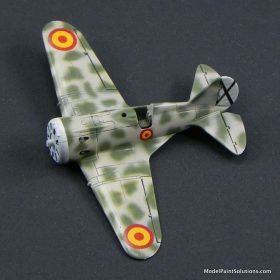 I could not have sprayed the camo on this 1/144 I-16 had I not used a 0.15mm tip. Having “the right tools for the right job” makes the work easier and way more enjoyable. 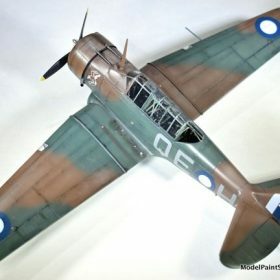 Many of the modelers that complain of having to deal with one or more of the Top Four Airbrushing Problems listed above use one dilution of paint (often 50% or a 1:1 ratio of paint to thinner) for every type of spray job. 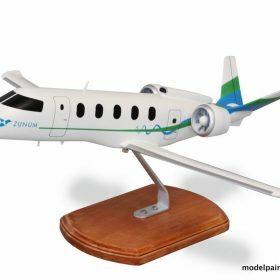 Many of their models are beautifully built with smooth, even finishes. However, the builders often describe suffering through multiple sanding, buffing, and/or surface preparation tricks they had to used to get a nice finish. 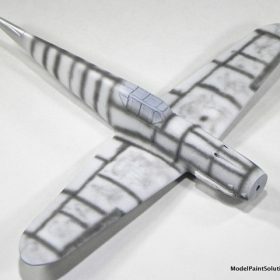 What follows are suggestions for diluting acrylic paints for each of the four basic types of airbrushing jobs, Fine-Line, General, Modulation, and Clear Coats, described above. 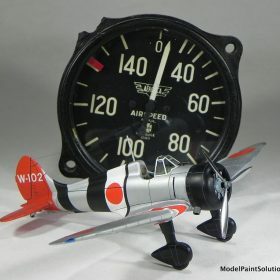 By acrylic paints I’m referring to brands such as Tamiya, Mission Models*, Vallejo, LifeColor, AKAN, and Model Master. For suggestions on how to prepare percent mixtures and tools to make the job quick and easy go here. 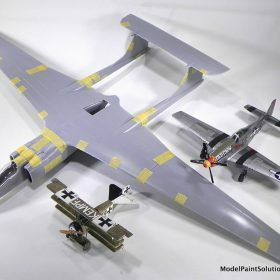 *Note: Mission Models is my go-to brand for primer and paint however they require a higher percent paint mixture than do most acrylic paints. 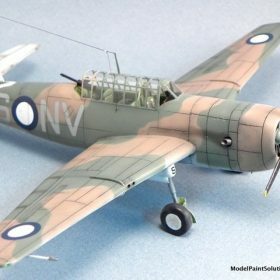 Please refer to specific articles for suggestions on diluting Mission paints. 1) I usually use the manufacturers thinner for whatever brand of paint I’m spraying. There are many thinner concoctions out there that may work better than the manufacturers and with proper experimentation I would (and have) use them. But, as a general rule, when evaluating a new paint I use the brands thinner. 2) I always add a paint retarder or flow enhancer to lessen tip dry. Acrylic paints tend to suffer from Tip Dry which refers to the build up of dried paint on the needle and nozzle that develops while spraying. This is especially the case if you’re spraying acrylics in a dry, arid climate. 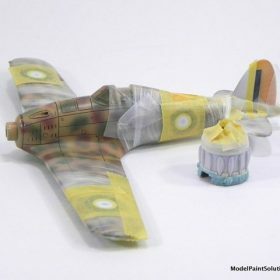 Most acrylic paints benefit from the addition of a retarder or flow agent which decreases the paints tendency to dry in general and in particular on the airbrush needle. Moreover, including a flow enhancer will decrease pebbly over-spray and increase leveling: both of which produce a smoother, finer finish. There are many such reagents available but the brand that I find works best with all the acrylic paints I’ve tested is Liquitex Flow-Aid added to ~5-8% by volume. I prepare a large mixture of the thinner I’m using with 5% Liquitex ahead of time. This makes diluting paints easier, quicker, and most importantly, reproducible. 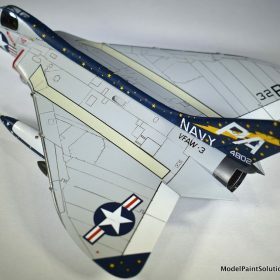 For more suggestions on diluting and spraying acrylic paints, check out Airbrushing Tips ‘n Tricks v2: Spraying Acrylic Paints. To shoot lines of ~1mm or Fine Lines, I dilute most acrylics to 20-25% paint with the balance made up with thinner (to 100% volume). When this dilution is sprayed at ~10psi with a working distance (tip to model) of 1-2cm (1/2-3/4in), it will provide thin, clean lines with minimal over-spray. To spray Super Fine Lines of 1mm or less (0.30 to 0.50mm) I dilute acrylics further to 10-20% (depending on the acrylic) and spray at ~6-8psi. The ability to reliably reduce the air pressure to less than 10psi makes shooting super fine lines easier and more reproducible. 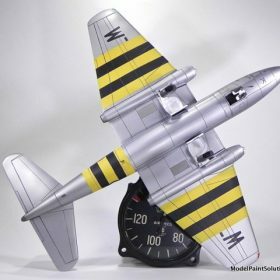 1) Set the compressor (or tank) gauge to 10psi while depressing the airbrush air lever as though you were spraying paint. By adjusting the pressure while the brush is “spraying” you are accounting for the 1-2psi drop in air pressure that occurs when the compressed air begins flowing into your brush. You may see the compressor gauge read 11 or even 12 psi when you let up on the air lever due to this drop. 2) With a reliable 10psi in the air line while spraying, I use an H&S In-Line Air Valve to reduce the pressure further to an estimated 6-8psi for super fine-line work. This is a “guesstimate” based on the solid 10psi coming into the brush and the feel of the air pressure when blown against the hand. 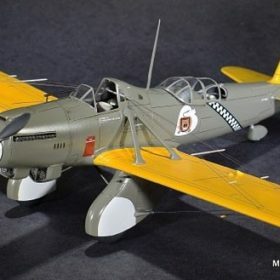 Using AKAN and Gunze lacquers diluted for Fine-Line spraying, the scheme on this Zvezda 1/144 I-16 (below) was shot at 6-8psi using a 0.15mm tip and a working distance of ~1cm (~1/3 in). 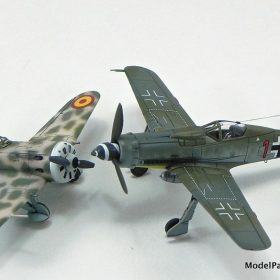 As an example of mottling in a larger scale, the scheme on this Hobby Bossy 1/72 Macchi Saetta (left) was shot with appropriately diluted Mission Models Paints applied at ~8psi using a 0.15mm tip. 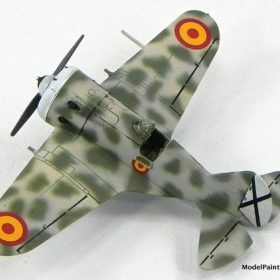 Similar to the Saetta above, the mottling on this 1/72 AZ Models Me-109G V-Tail was shot with appropriately diluted Mission Models Paint applied at ~6-8psi with an Infinity fitted with a 0.15mm tip (right). For the majority of airbrushing jobs during assembly I dilute most acrylics to roughly 30-40% paint ( balance to 100% volume with thinner). This dilution gives good coverage for general jobs when sprayed at 10-15psi (usually ~12psi) and a working distance of 8-10cm (3-4 in.). Tip sizes of 0.20 to 0.35mm are well suited for most General spray jobs during assembly. 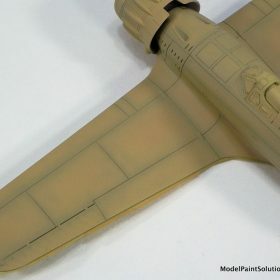 In addition, tips on the lower end of this range are what I prefer to use when spraying schemes on larger scale models like 1/48, 1/35, and 1/32 (see below). 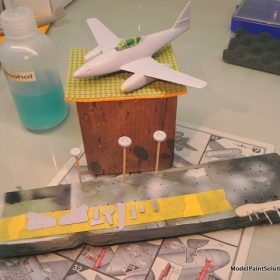 During assembly parts and are stuck to a painting board with wads of putty for both priming and painting. Tips of 0.20 to 0.35 are well suited to this type of General spray job as shown in the examples below. 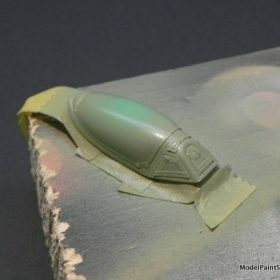 If I’m going to be spraying over pre-shading a process called “paint modulation” as described by Adam Wilder, the ideal sized tip will largely depend on the size of the model being painted. 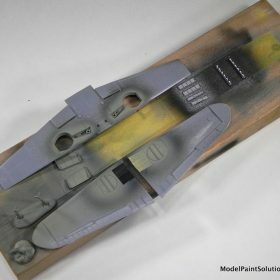 For an easy example, consider spraying the 1/72 Hobby Boss Saetta Italian Giallo (~light yellow-tan) after it had been shot with Mission Models White Primer (using 0.20mm tip) and the panel lines pre-shaded with Mission Slate Gray (using a 0.15mm tip: below). For over-shooting pre-shading like this, I’ll typically use a dilution of 10-25% paint (balance in thinner). A relatively low paint dilution will require more passes to attain sufficient coverage. However, requiring additional passes provides better control over the density of coverage and lessens the chance of applying too heavy a coat thereby loosing the subtle pre-shading underneath. 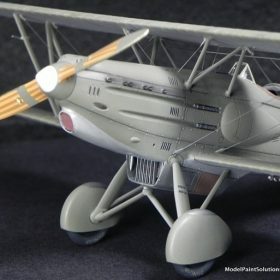 For a model the size of the 1/72 Saetta (or a comparably sized area on a larger model: see below), I prefer using a 0.20mm tip. Tips of up to ~0.35 would work as well. Bear in mind, even larger tips can be made to work especially by some one with experience. That said using a larger tip increases the likelihood of spraying too heavy a coat. Conversely, using a small tip increases the chances of getting a rough, pebbly finish. 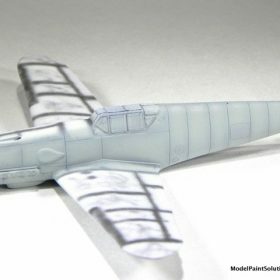 Another example of over-shooting pre-shading with sufficiently diluted paint and a 0.2mm tip is this 1/72 scale AZ Models Me-109G V-Tail. 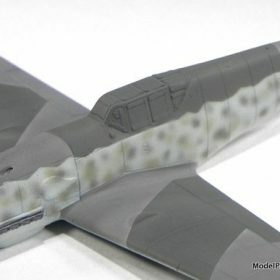 As with the Saetta above, the V-Tail was shot with Mission Models White Primer (0.20mm tip), the panel lines were pre-shaded with Mission Slate Gray (0.15mm tip), and the Mission RLM76 was applied with a 0.20mm tip (below). 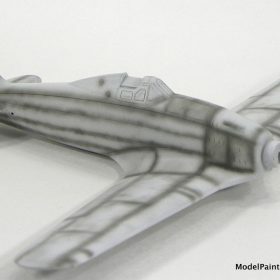 As with the 1/72 scale examples above each color of the Hornet scheme was shot with a 0.20mm tip in order to better control the degree of coverage thereby leaving the pre-shading (0.15mm tip) showing through the final coat (left). 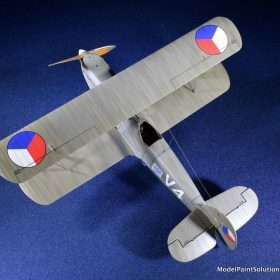 While the individual colors were shot with a 0.20mm tip, the large area of the model (especially the wings) required that the blue on the belly and all clear coats and primer be applied with a 0.4mm tip (more below). -The color of the primer white, black, gray or ? In general, darker primers require higher concentrations of the color being shot over them, especially if the color is light such as yellow or white. -The color of the pre-shading, black, gray, brown? Likewise, panels pre-shaded with black often take extra passes to achieve sufficient coverage and blend them in with the surrounding areas. 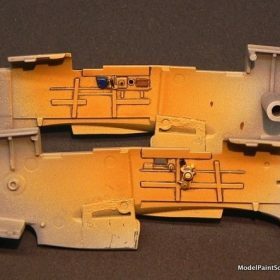 On the opposite end of the spraying spectrum from Fine-Lines would be laying down Clear Coats. 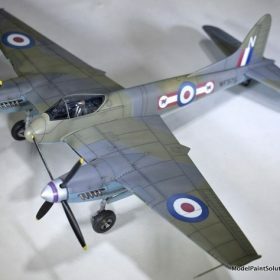 I also include Primers in this category as they especially should be applied with larger sized tips but primers are beyond the scope of this article. They will be the topic of a future Tips ‘n Tricks. There are many different acrylic gloss coats available and each has its own set of strengths, weaknesses and requirements with regards to best dilution. Many clear coats like Alclad Aqua Gloss and Future Floor Wax (or Pledge with Future Shine as its now called) are best sprayed neat (straight from the bottle) or diluted very little. 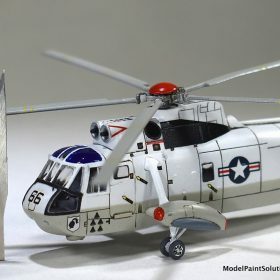 In contrast I get the best results with gloss coats by Mission Models, Gunze, Tamiya, and Vallejo when these clears are diluted with their respective thinners to 30-50% gloss. Your mileage may differ. Whatever dilution used I apply the same general rule of “the thinner the coat, the better” to all gloss coats. 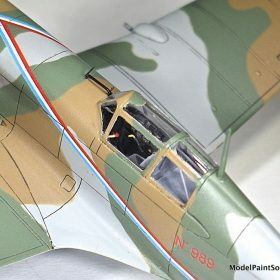 In addition to providing a smoother, finer finish, a thin coat of gloss will facilitate the wicking of washes along inscribing and the crisp angles of surface details. A heavy coat of gloss will soften these details. Again, with the myriad of clear acrylic flat coats available there is no one dilution that would work for them all. That said the general rule of “the thinner the coat, the better” can also be applied to flat or semi-flat coats. 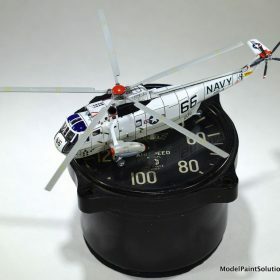 Furthermore, modelers of military vehicles tend to apply too heavy a flat coat. 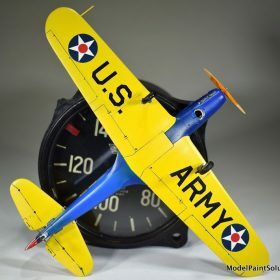 This is especially true for aircraft models. To lessen the chances of applying too thick a coat, I err on the side of less is more and dilute my Flats to 10-25% depending on the manufacturer and the degree of flat I’m looking for. 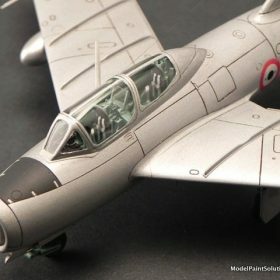 In general, I apply clear coats to large 1/72 and most 1/48, 1/35, and 1/32 scale models using a 0.40mm tip or larger. Application of clear coats with larger tips will produce finishes that are smoother and more even. 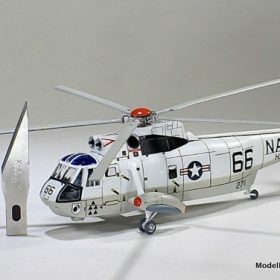 As previously mentioned, exceptions have to be made in lieu of size, as with the application of clear coats to 1/144th scale models using a 0.20mm tip. 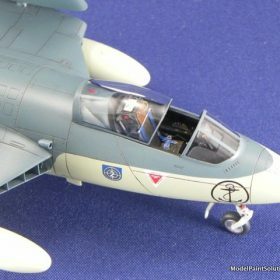 A more typical example to consider is the Modelsvit 1/72 M17 Stratosphera. 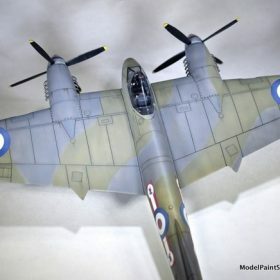 To accommodate this rather large model and to achieve as smooth a finish as possible all the primers, paints, and clear coats were all applied using a 0.40mm tip. 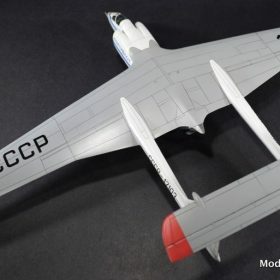 Similarly, finishing the Zunum Prototype display model with its ~2 foot wingspan required using a 0.4mm tip for all primers and clear coats. Job Tip Size Percent Paint PSI Work Dist. 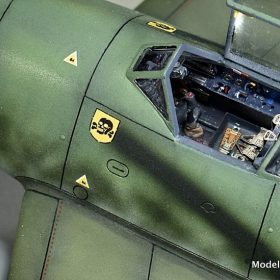 As a way of illustrating matching paint dilution and tip size to the job, this information (and more) is provided on multiple models ranging from 1/144 to 1/48 below. 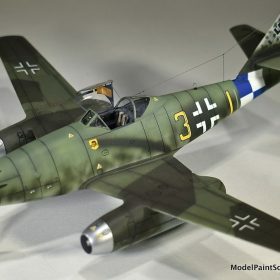 The utility of using a lower dilution (10-25%) for paint modulation (spraying over pre-shading) is illustrated by the faint pattern of vertical and horizontal lines (representing puttied fuselage panels) that can be seen underlying the camouflage of this Me-262. 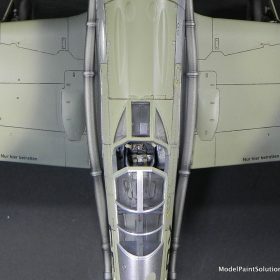 The “putty lines” are best seen in the lighter shaded areas just below and behind the cockpit. Whew, that was a rather long article. Thanks for reading along! 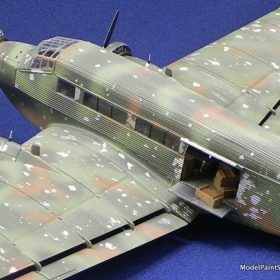 I hope that served to give you a starting point for matching the airbrush tip, paint dilution, and pressure to the painting job at hand. 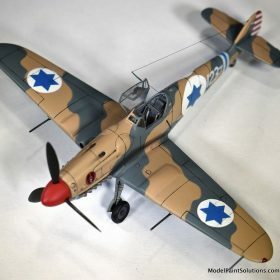 If you have any questions or want additional information, drop me a line at john@modelpaintsol.com. Now there’s got to be something around here that needs priming or painting !